The twin-island nation of St. Kitts & Nevis is known for beautiful scenery and a more relaxed atmosphere than elsewhere in the Caribbean. Tourists returning from visiting the islands often have stories of taking a rainforest tour, snorkeling in the warm water, spotting a sea turtle on the beach, or watching a troop of monkeys run across the road. The monkeys in particular have become part of the landscape and culture. 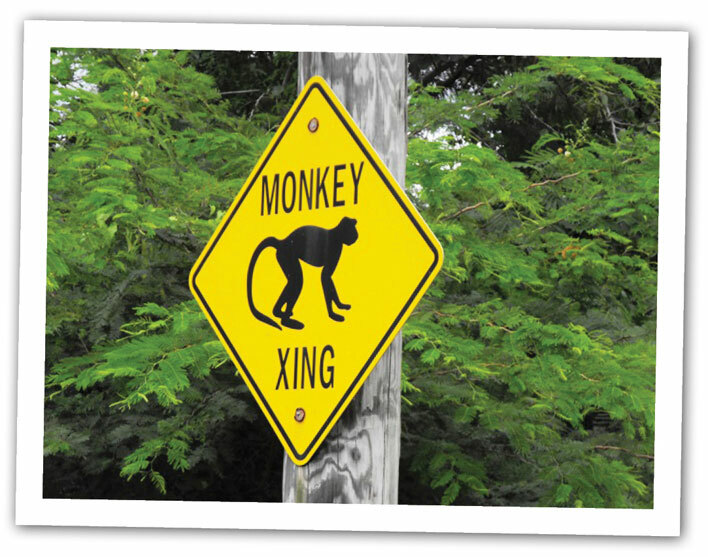 Although you’re not guaranteed to see a wild monkey if you visit St. Kitts or Nevis, it’s hard to miss the influence monkeys have had on the islands. 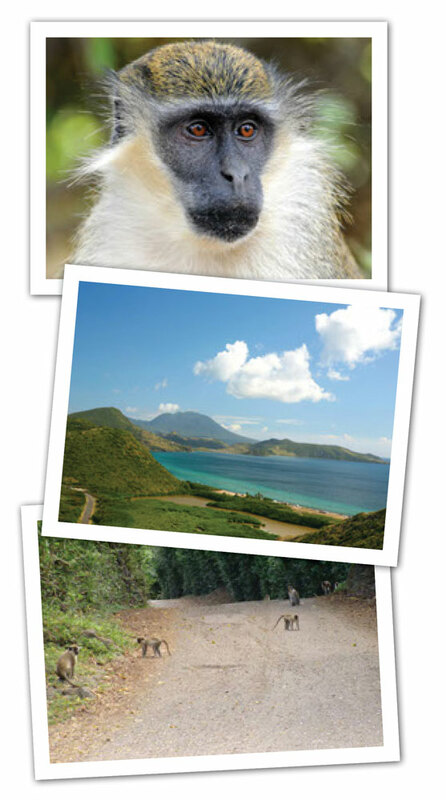 On St. Kitts, you can hike up Monkey Hill or enjoy a rum punch at The Monkey Bar. One of the best dive sites on Nevis is called Monkey Shoals. Travel guides note which nature trails offer visitors a good chance to spot monkeys, and photographs of monkeys feature prominently on the websites of tour companies. Promotional materials published by an official tourism agency speak of “comical” monkeys and the sounds of monkeys “chattering in the trees.” You can find monkeys on postage stamps issued by the islands, and monkeys have even made their way into local proverbs. Guidebooks will tell you the monkeys were brought to the islands from Africa by the French (or the British), and that they either escaped or were set free some time in the late 17th century, but what is left out is the sad fact that each year wild monkeys are trapped, stuffed into wooden crates and flown off the islands. Their destination? Research and testing laboratories where pain and suffering are routine. The United States is the largest importer of monkeys from St. Kitts & Nevis. Miami is the most common port of entry. Help us stop this cruel trade. African green, or “vervet” monkeys (Chlorocebus aethiops) have lived on St. Kitts & Nevis for over 300 years. Estimates vary widely, but today there are thousands of free-roaming monkeys on the islands. The monkeys live in mountain forests, where they feed off leaves, flowers, berries, fruit and insects. To the frustration of small-scale farmers, monkeys on St. Kitts & Nevis can cause damage to crops, and pose a challenge as the islands work to produce more of their own food and import less. The killing or export of monkeys is sometimes promoted as a solution to human-monkey conflicts. This is not only cruel, but it fails to address the issue long-term. There are ways to reduce the indigenous monkey population which are not only humane, but also more effective. In a report released in June 2010, the St. Kitts & Nevis Ministry of Agriculture proposed two long-term strategies to control the monkey population and reduce crop destruction: a spay & neuter program, and the establishment of strategically located feeding sites to provide monkeys an alternative source of food. The sterilization of monkeys has the potential to significantly decrease the population. A spay & neuter program could also act as a teaching tool for the Ross University School of Veterinary Medicine, located on St. Kitts. The report also stated that the monkey population on the islands has stabilized—the monkey population is not growing. Two organizations on St. Kitts—the Behavioral Science Foundation (dba Primate Resources International) and the St. Kitts Biomedical Research Foundation—purchase wild-caught monkeys from trappers and sell them for export. Both organizations also maintain laboratory facilities on the island, where monkeys are used in research and testing for pharmaceutical and biotech corporations. Tourism is the key to economic growth for St. Kitts & Nevis. Tourists, as well as hotels, tour companies and other businesses that rely on tourism, have a strong voice in shaping government policies. We are not calling for a boycott of St. Kitts & Nevis. On the contrary, we want you to visit the islands (we wish we were there right now), but also to speak out against the cruel primate trade and urge your hotel, tour operator, etc. to do the same. It is our hope that ethical travelers, hotels and other tourism-related businesses on St. Kitts & Nevis will use their influence to convince the government to halt the export of monkeys. The government of St. Kitts & Nevis has a choice. Will the islands be known for uncrowded beaches, fantastic golf courses, historic sites and lush rainforests, or will they be known as one of a small number of nations that export wild monkeys for use in research and testing. Which industry is more important to the future of St. Kitts & Nevis? 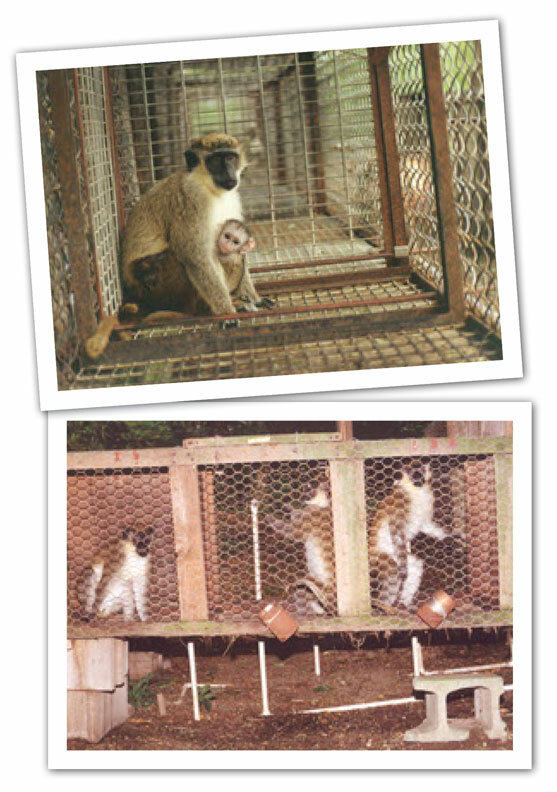 It would not be unprecedented for St. Kitts & Nevis to ban the export of monkeys for research. India banned the export of monkeys for use in research in 1978. Bangladesh followed suit in 1979. Malaysia banned monkey exports in 1984. In 2009, after an international campaign by animal rights activists, the government of Nepal cancelled plans to breed and export monkeys for biomedical research. In 2013, Israel banned the export of wild-caught monkeys (a complete ban on the exportation of monkeys for research purposes took effect in 2015). Each year, vervet monkeys on St. Kitts and Nevis are torn from their families and forest homes and exported to laboratories around the world. Once wild and free, these sensitive and intelligent animals end their lives in laboratories where pain and suffering are routine. I urge you to ban the export of monkeys destined for the research industry. I understand that there are conflicts between humans and monkeys on St. Kitts and Nevis, but there are ways of managing this situation without resorting to export or killing. Please consider the impact that this continued trade will have upon the international reputation of St. Kitts and Nevis. *If you have visited St. Kitts & Nevis, or if you are considering a future trip, please mention that when you write! Send a copy of your letter to the Ministers of Tourism and to the national tourism agencies for St. Kitts and Nevis. 3) Have you traveled to St. Kitts and Nevis? Did you see any wild monkeys? We would like to hear from you and see your photographs. Are you the owner of a business on St. Kitts & Nevis? Are you troubled by the export of monkeys from St. Kitts & Nevis? Please let us know so that we can add your company to our list of animal-friendly businesses on St. Kitts & Nevis.